Calvi citadel in the morning, looking down on the port below. 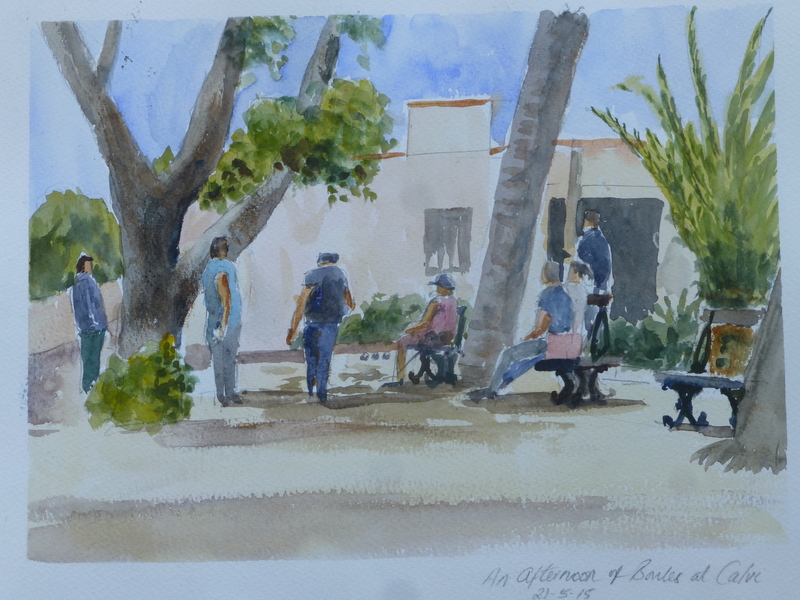 The French Foreign Legion, well a few of them anyway, gathered at the building on the left for their morning run as I sat and painted. There is a big Foreign Legion camp just up the road and the paratroopers have their HQ in this citadel. 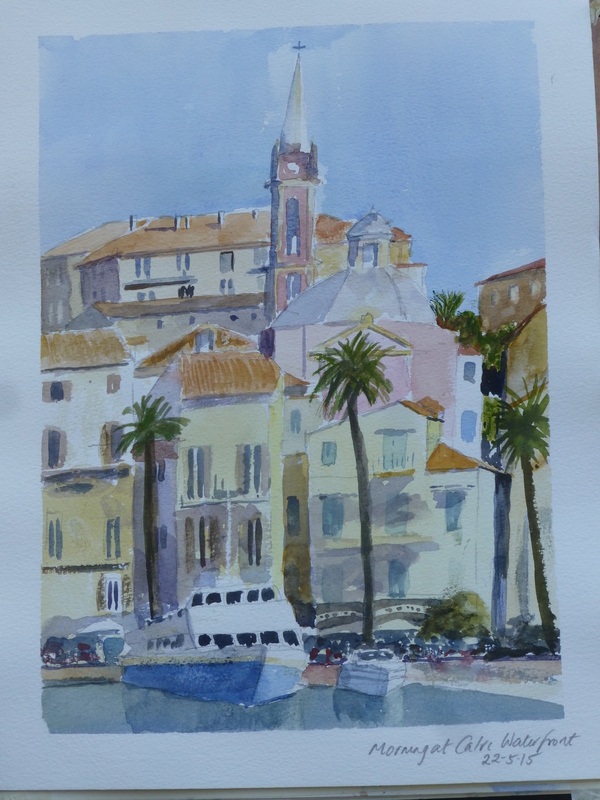 We took a trip to St Florent which seemed a smaller and les frenetic version of St Tropez. 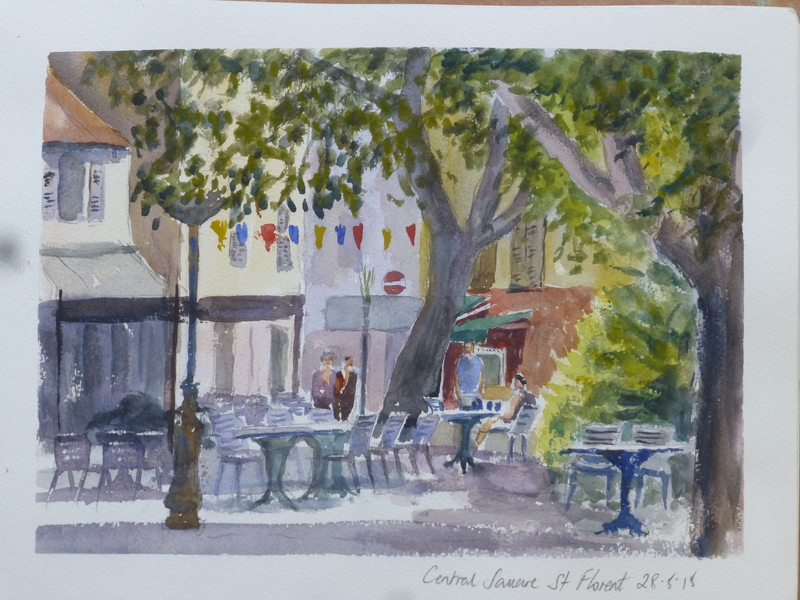 I sat in the central square and started this painting. As I worked a woman came up and asked me how I was getting on. She was an artist who owned a gallery right by where I was working. It was shut for lunch and she was returning to reopen. She came back again to further review progress. I thought that she was going to give me a mark. The hillside town of St Antonino is the highest in the area. This was a view of it from one of our earlier walks. We did climb up and visit it, but unfortunately there looked like a storm brewing, so returned. 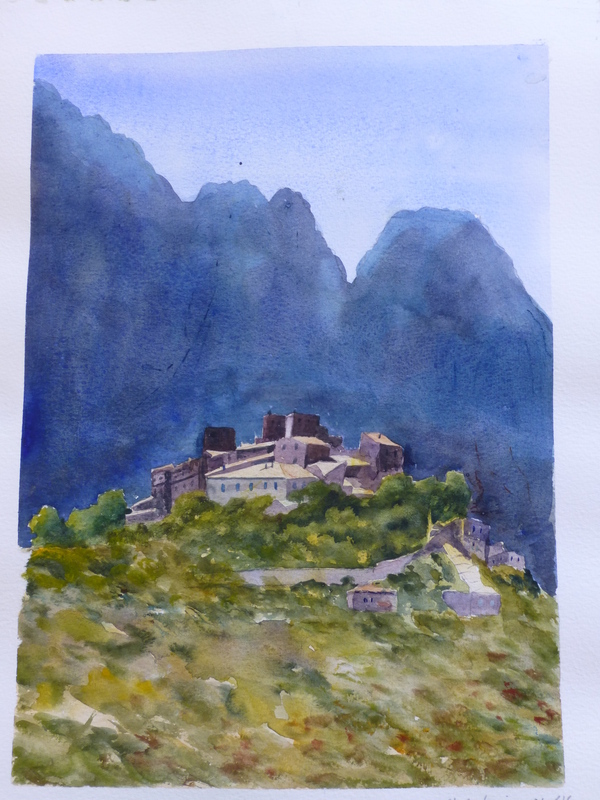 The storm stayed in the mountains and I did a painting of Pigna instead. 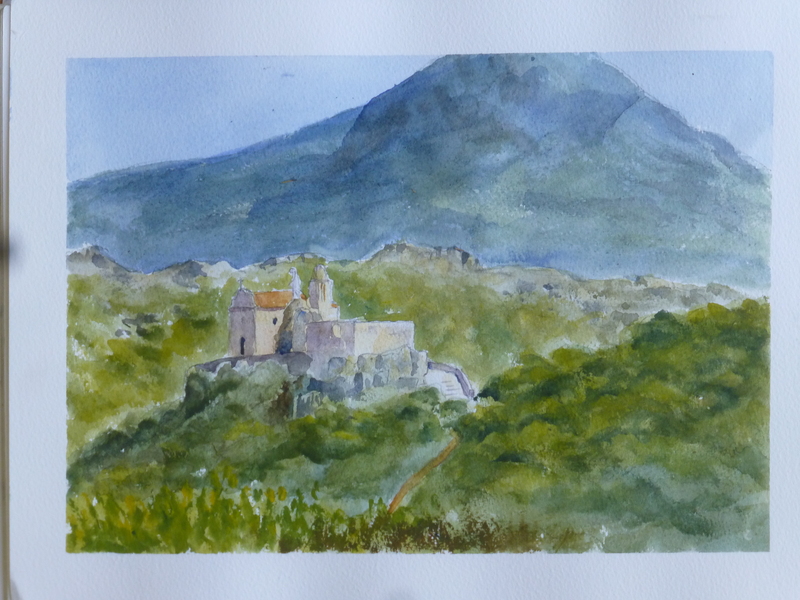 This is the old fort at Girolata on the Scandola Nature reserve in Corsica. There are only two ways, apart from parachute, to get here either walk or get a boat. We did the latter. It was a bay within a bay and had cattle on the seashore as well as the odd bar. You can say what you like about the French, but they put on a good boat trip. Who else would include a two hour lunch stop. Instead of eating I went and painted. This is a view of Pigna from the old donkey track to a nearby hillside town, Corbara. 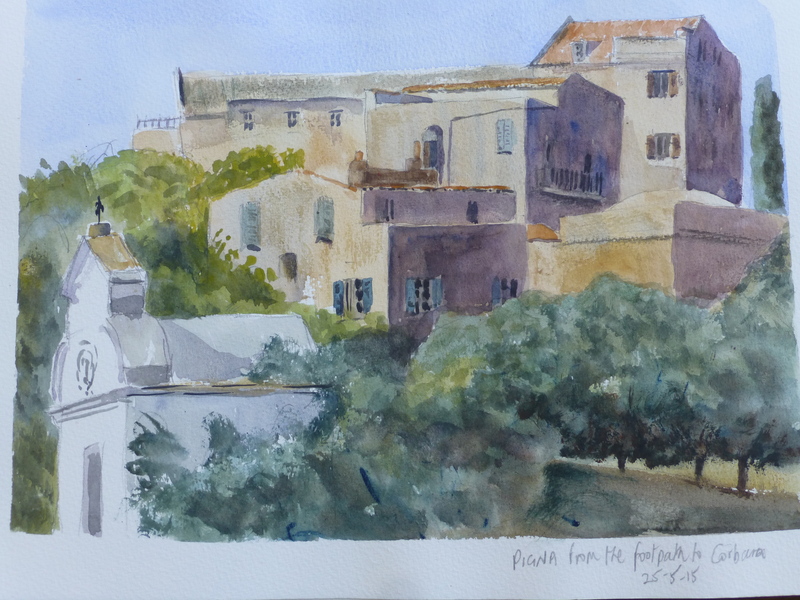 We have used Pigna as a base to walk to various places. Lovely old tracks, centuries old that are lined with tumbledown walls and shaded with olive and oak trees. 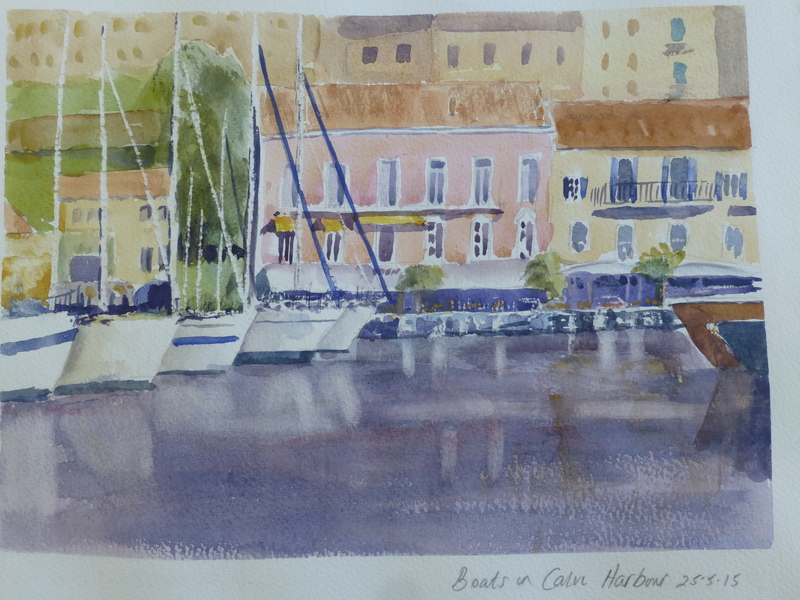 Another morning view of Calvi harbour. I liked the ranks of yacht bows lined in the water. This is the top of Corbara, a small town we walked to. 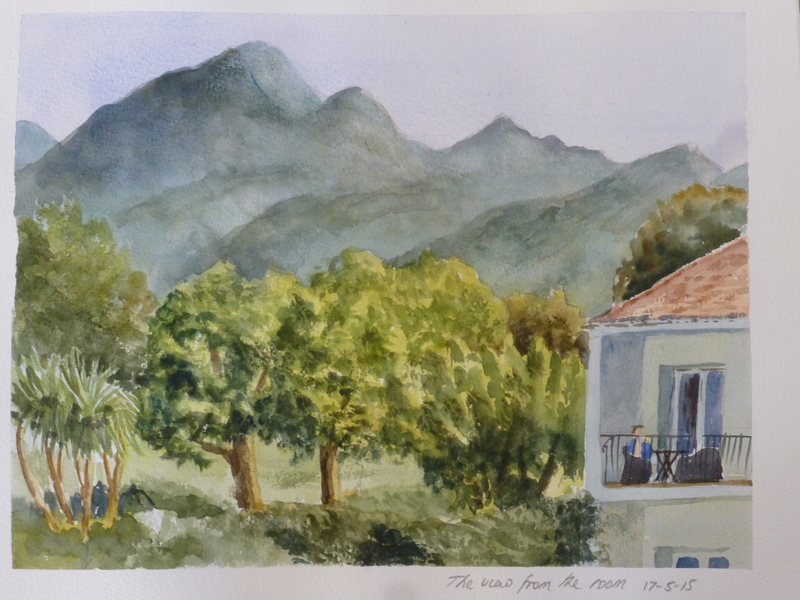 It nestles high up in the Corsican hills looking down on the valley and sea. 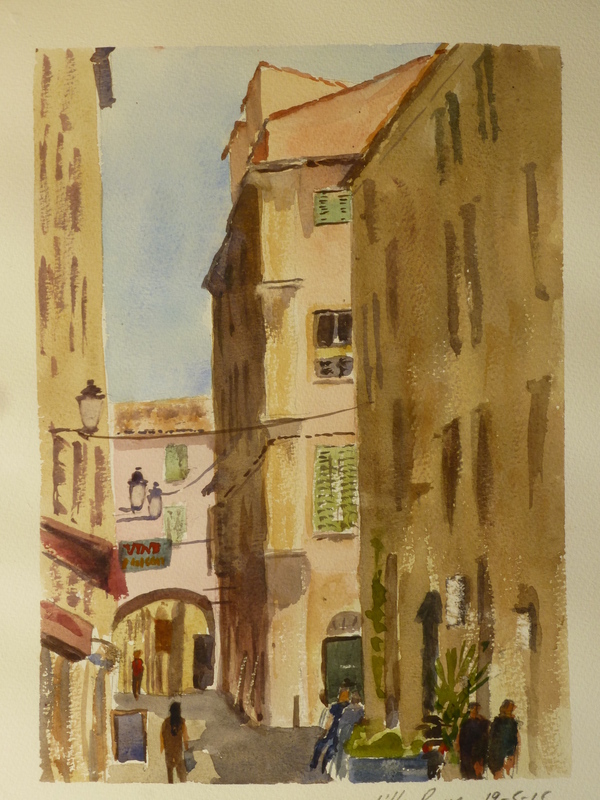 This was Rue Georges Clemenceau in Calvi. 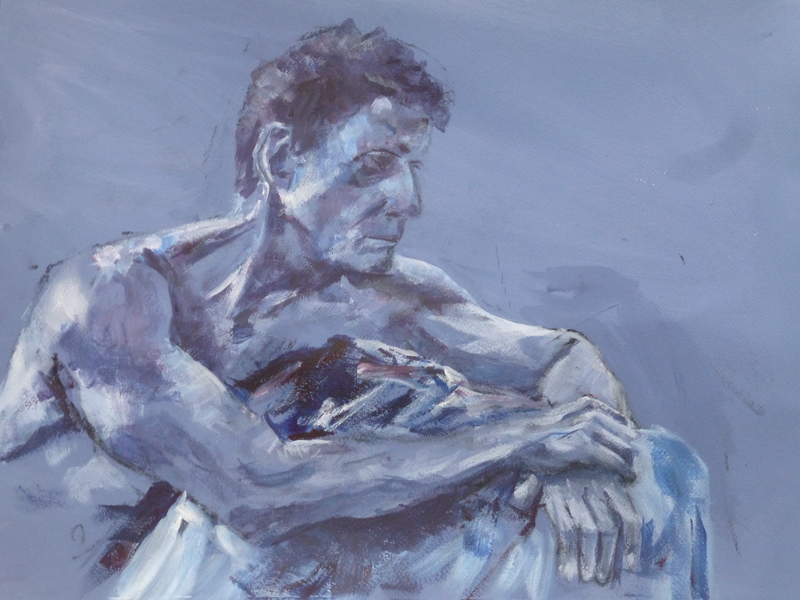 I had a wonderful vantage point, it was just that the wind was so strong I had to keep everything low to prevent it going over the parapet which made it difficult to work – bending over and mixing paint at my feet. What with the wind and the tourists wanting to photograph me whilst I was holding on to everything, it was a real struggle. However it was a great scene with good contrasts. I will try another version when I get home. This is the waterfront at Calvi in the morning. Another great scene. It looks like they are building a fence around the harbour so riff-raff like me wont be able to get this view in future. 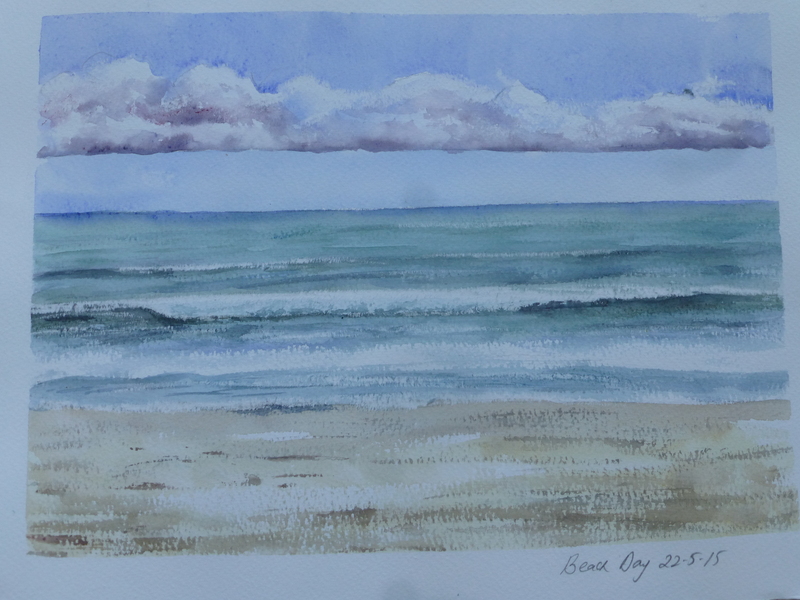 There is another view I would like to do, but the last two days haven’t been very sunny. Hopefully I’ll get down there tomorrow. 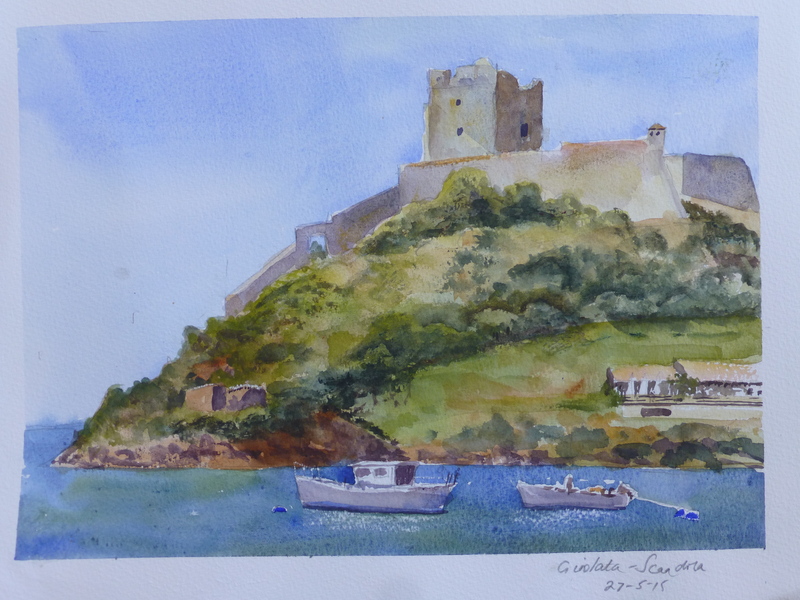 I was sitting admiring the view of the harbour at Calvi when the boys came own for a spot of boules. I managed to get a few of them on paper. I also took some photos so I will try another version when I get home. After a walk and a spot of lunch we sat down on the beach. So this was the view. Well nearly, there were a couple of cruise ships blocking the view, but I really couldn’t be bothered. I just wanted to pretend it was a desert island, with all the wine you can drink. 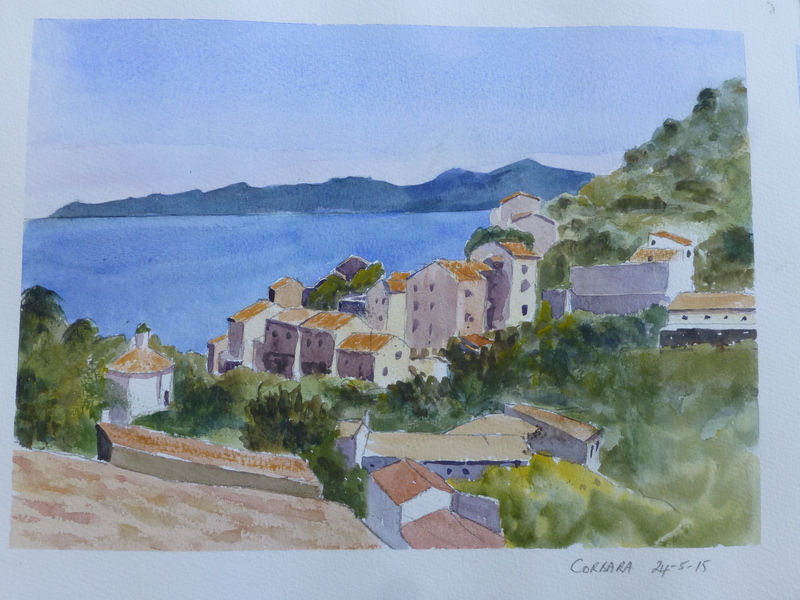 We travelled to along the coast in the local train, passing the beaches and small villages of northern Corsica. 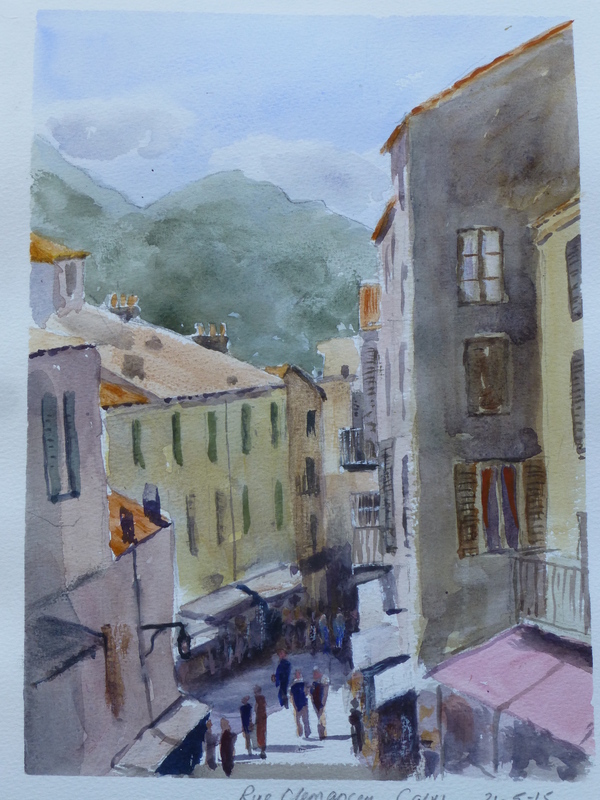 At the end of the line I sat in a café at a small port of L’lle Rousse and painted one of the alleyways that criss-crossed the town. 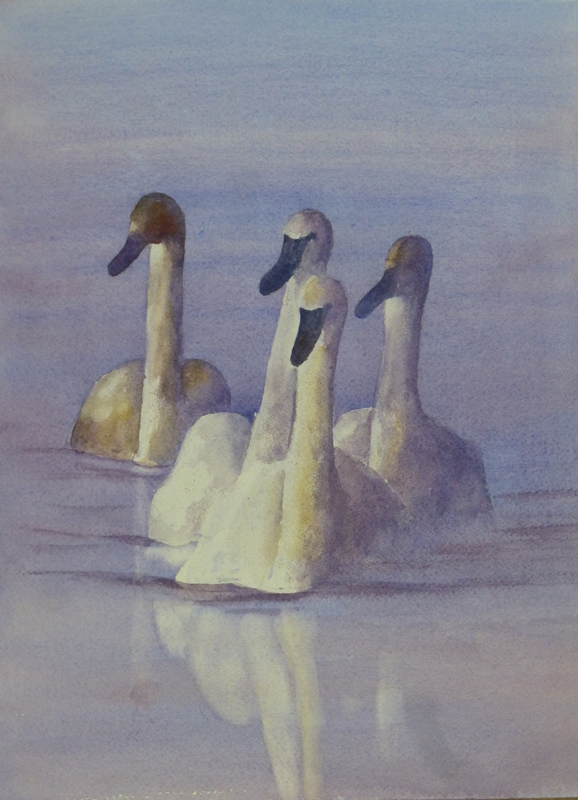 I started painting this yesterday morning but whilst I was drawing it started to rain. 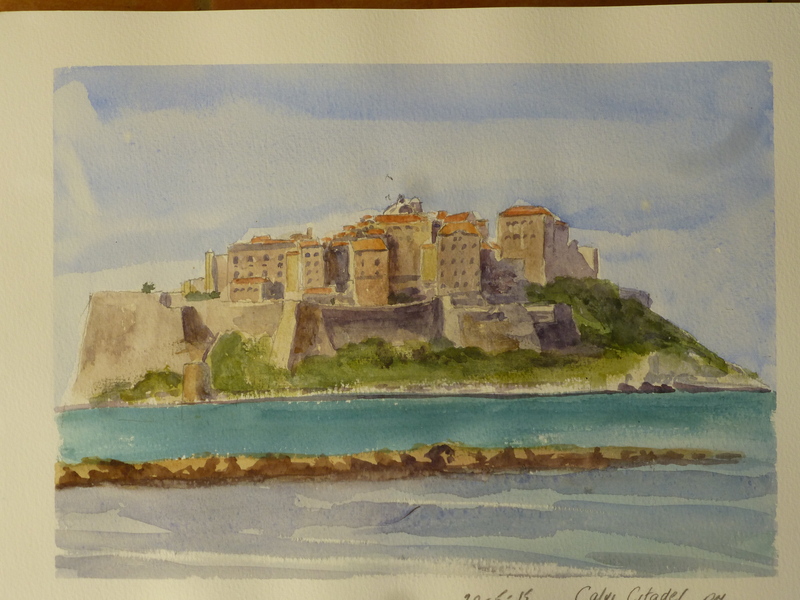 Later that afternoon, when the sun came out, I came back and completed the Citadel at Calvi. The buildings stayed the same but the shadows had shifted. I might have another go at it in the next few days in the morning and from a different angle. 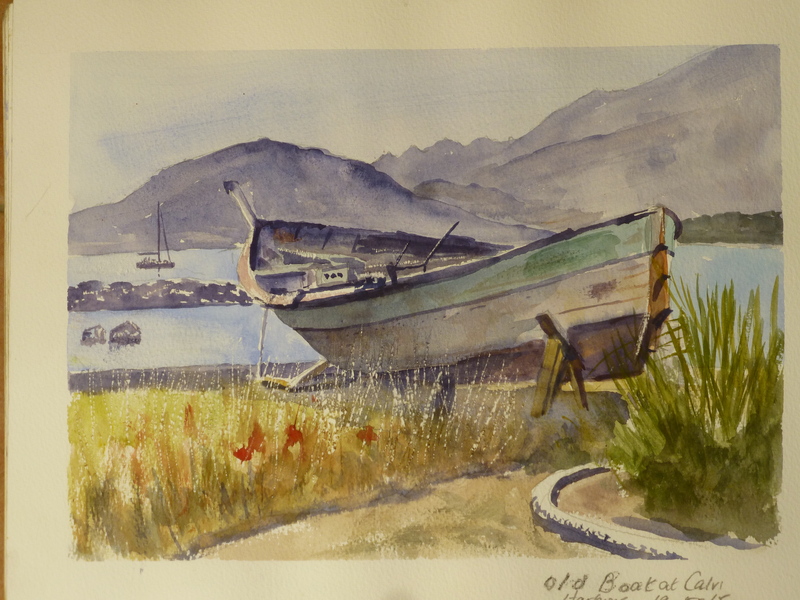 This is an old abandoned boat on the dock at Calvi. I liked the way that it had been left high and dry with the grasses closing in on the hulk. 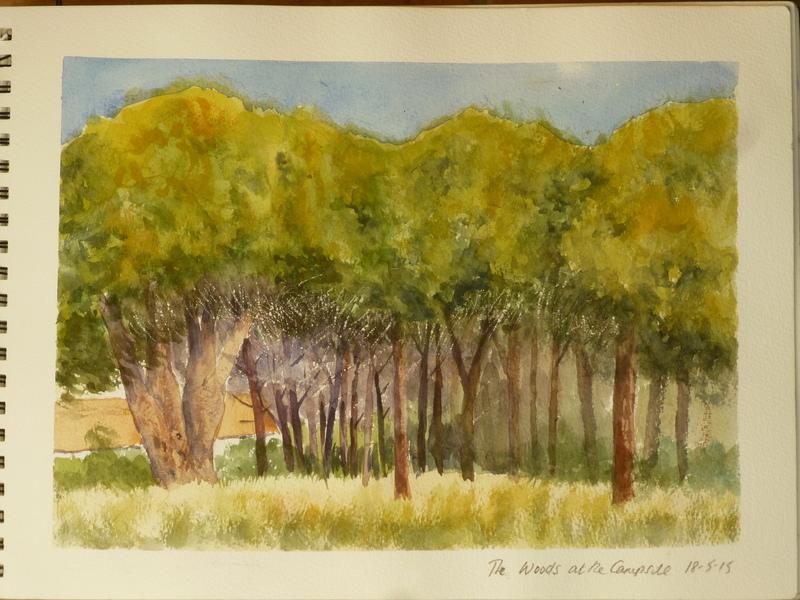 These are the woods alongside of the drive to the apartments where we are staying. It looks like they will be expanding into this field at some point. I was taken by the way the sun lit the trees. Whilst I sat in the grass a dog seemed to take displeasure in me being there and at one point I thought it was going to attack me. When I stood up it thought better of it and vanished, but from then on I was looking over my shoulder in case it returned. They don’t talk about these perils in the art books. 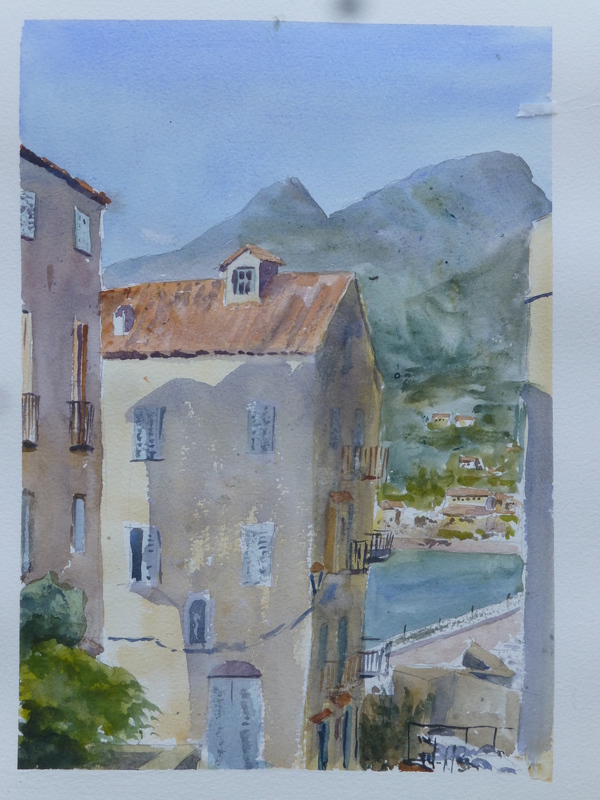 Well, we’ve decamped for a couple of weeks to Calvi on Corsica in the Mediterranean just off France and Italy.It’s given me a chance to get out with some paints. 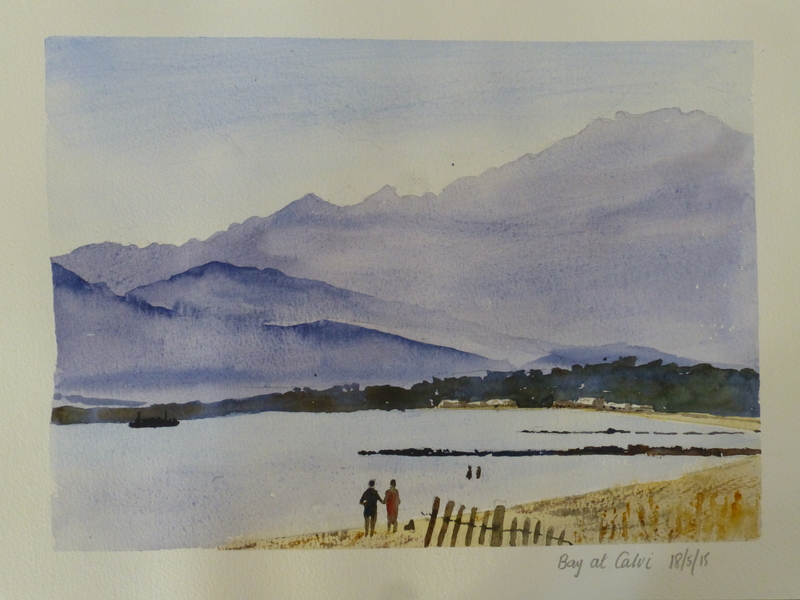 The top one is this morning across the bay at Calvi. Pity about the far shoreline, but I was under duress having left my palette in the apartment and mixing my colours on the bottom of a jam jar. The bottom one is the view from our balcony in the afternoon with the sun coming in from the right. It’s a grubby old business, but someone’s got to do it. There will be more sketches to come.